RASPBERRY PUREE - Puree the thawed raspberries and lemon juice in the food processor or blender. To remove the seeds, press the puree through a strainer or food mill. Keep chilled in the refrigerator. 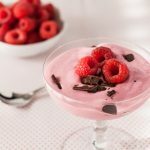 Stir together the raspberry puree, Greek yogurt, honey, and the shaved dark chocolate until thoroughly combined. Top with fresh raspberries and serve.